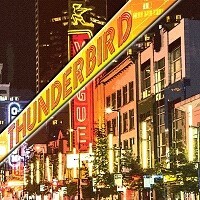 It's been two years since the Canadians THUNDERBIRD released their "Heavyweight" album in 2016. Did they choose that name from a ZZ TOP song? I don't know! Their debut album "What's the Word" was completed in 2006. They then took a break of almost ten years between the two. Now we have their latest work, the eponymous album. Recorded in Vancouver , they hired the legendary engineer Mike Fraser (AEROSMITH,AC/DC,VAN HALEN). They also welcomed a new member on guitars (Brice Tabish), a 26 years old young full of talent, promising guitarist. Peter Allen was hired to conduct a string section in the last track of the album. Also they hired Jazz pianist Chris Gestrin for the piano parts. This project is mature and very serious business. All members are very experienced musicians and contributed to a lot of projects and artists around the word. It all starts with a choir to get us into their first riffs. Lafrance's voice fits very well in the song. The guitar work are very original for a rock band…many variations while being catchy as hell. I can't resist to headbang and found myself wanting to sing along even if i don't know the lyric yet. I really like the guitar, ranging from metal like to kinda gypsy playing. Powerful opener, "Liar (Fool's Gold)" is great work, I really like it. The second track "Little Jenny" is very entertaining. I wish i could listen to it in my car, speeding tickets included! It's a basic song at first but has some excellent guitar solos. This song makes me think about Vince Neil and MOTLEY CRUE for the teenage riot and rebel thing .Also SKID ROW's "18 and Life." The song is different but the story and feel is quite similar. "Star" reminds me of BROWNVILLE STATION. Effective rock with nice guitar melodies to accompany the rhythm section. Very 80's rock. The backing vocals are more used here which is nice. We also have another very cool solo to prevent repetition dullness. This one is quite different. "Rain" is a power ballad full of great energy and motion. Well written song. This formula has been used so many times but these guys knows how to do it best. Acoustic guitars are used too and it gives more perspective to the song. It's a well written song, and we are pleased to hear another quite creative solo. All seems in its right place. Wow. It can't rain all the time! "Into the Sun" is more fast paced to get us back into a whirlwind of bass attack and the drumming is quite good and fast.Mr Stodola knows how to drum.Technique and efficiency blended with guitar's magnificent act killing it! "Painted Lady" is a darker song with a strong vocal harmonies approach. Quite a cool song but not my favorite. "Revolution" has twin guitar work, harmonically and different directions too. They are again using powerful chords for a solid rock performance.I can't help headbangin' again. "Man of Clay" leaves the electric guitar to get us overwhelmed with beautiful acoustic guitar and Lafrance singing in a more breathing and smooth way. It's a nice ballad to take a little rest. Perfect campfire song. It reminds me of QUEENSRYCHE or EXTREME's ballads. The production is excellent, amazing work. "I'm with You" is another high quality offering. The riffs are hypnotic and really moving, and teamed up with great guitar licks. This one doesn't disappoint me. I'm with you guys! "On the Brink" sounds a lot like MOTLEY CRUE for me. This is a good thing .It's not copycat thing here but surely draws from their inspiration…in Lafrance's way of singing and the song structure. The second part of the song's got very inspired guitar, Flamenco like, Corea's inspired little time before returning to what they do best: ROCK. "King Rat" is the song i waited for: the one that has wonderful piano. Nice mastering job on this one. Nice lyrics too. We clearly hear the piano. I was waiting for hearing the piano alone, but in vain. Well maybe the last song with offer me a surprise, who knows. Finally the last song "Vampire" has a nice string section to add drama and tragedy feel to the song. I really like that approach. This one must be amazing to hear live. I can imagine a theatrical live performance for this one easily. I love this one. I'd like to hear more songs like this one from them. Adding orchestral section of strings adds emotion and energy to the song. Amazing job, and the guitar work is flawless one again. A big puzzle completed, all pieces in its own place, giving a spectacular view of this piece of art. Love it guys!!!!! Give us more! Flawless work, but the only thing is maybe the length of the album. More songs makes cohesion more difficult to establish.This is very good but 12 songs is a little much of a travel. Twelve songs in two years is quite incredible and fast writing. Here we can say creativity, talent, execution, and experience are hard at work. GOOD JOB!